Bits & Scraps Of My Life: How bout a scrappy color challenge with The Pink Elephant!! How bout a scrappy color challenge with The Pink Elephant!! Are ya ready to play along? So...onto this weeks challenge!!! Drum Roll!!!!! It's a color challenge!!! TA DA!!!! And what beautiful creations the scrap team came up with this week!! You gotta head to the TPE blog and see!!! 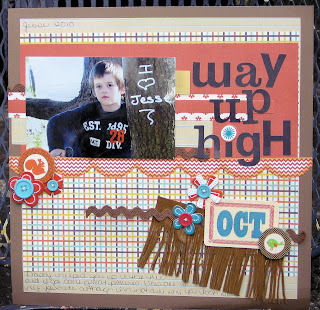 This week our Color Combo Challenge is to use the colors Orange and Brown! Perfect for those fall themed pages or just cuz you love orange and brown!! I'm gonna be nothin but real here....I kinda groaned when I saw the color palette. But once I found my stuff this all came together perfectly and I love the end result! 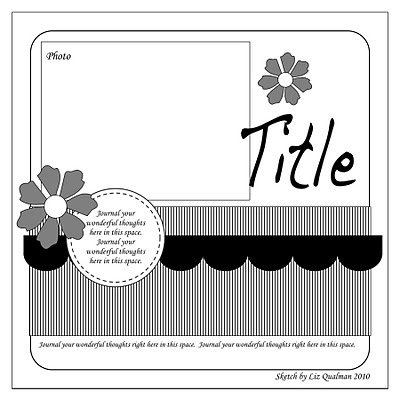 I used Sassafras Lass Bungle Jungle papers, Bazzill cardstock, Sassafras flowers that I adore!! and some ribbon scraps that were in my goodie bag from Hobby Lobby. I'm not sure about my alpha's.....the package they came in is gone and I really have no clue but I am thinking they are Remarks by American Crafts. I also made use of this sketch from Liz Qualman that I just fell in love with!! I did change it up a bit....but I just adore this!!! This is one of the photos we took last week of Jesse in the tree.....so sad looking!! I found some really neat photo overlays I have been playing with and I am gonna have all of these reprinted and make something to hang on the wall in my "one day" scraproom......LOL. Well, have you got any scrappy ideas? Grab that glue and paper and get busy!!! We'd love to have you play along with us....the more the merrier ya know!! Love how you used the brown and orange. The embellishments and paper you used rock.